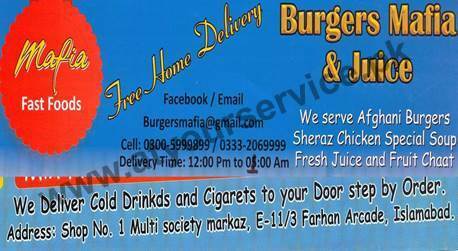 Mafia Fast Foods is located in E-11/3, Islamabad. We serve Afghani Burgers, Sheraz Chicken, Special Soup, Fresh Juices, and Fruit Chaat. Home delivery service is available. We also deliver cold drinks and cigarettes at your doorstep, if you so desire.